Welcome, friends, to the 250th blog post from the World's Worst Records . James Travis Reeves is rightly revered as a country music legend. A purveyor of the Nashville sound, thanks partly to his association with guitarist and producer Chet Atkins, Jim Reeves scored his debut hit in 1953 and managed more than 30 chart singles in the United States – including the standards He’ll Have to Go and Welcome to my World - before tragedy struck a little over a decade later. His life ended ridiculously early – three weeks before his 41st birthday in July 1964 – when the plane he was piloting (and which also carried his manager Dean Manuel) was caught in a violent thunderstorm. The single-engine plane stalled, went into a tailspin and crashed, killing both occupants. But death was not the end of Reeves’ career: he was signed to RCA, a company who have never let the death of an act bother them. Jim left a massive backlog of unreleased music – something like 80 tracks from rough demos to finished sessions and, between 1965 and 1984, he landed even more chart smashes than he had during his life. His posthumous UK Number One Distant Drums became his biggest international hit and the best selling single of his career. Thanks to RCA - and to his widow Mary (to whom, apparently, Jim was less than faithful) - his recordings have been issued and reissued, occasionally slathered with new instrumentation and even artificially turned into duets with the equally dead Patsy Cline, who also expired in plane crash. I think it’s incredible that no-one at RCA or MCA (who owned Cline’s back catalogue) thought that issuing a fake duet of the song I Fall to Pieces was in poor taste. But before RCA paired Jim’s ghost with Patsy’s they issued a few other howlers, two of which I present for you today. First up is Old Tige, the B-side to Jim's huge 1966 hit Distant Drums. Old Tige was one of my father’s favourite records, but it is beyond horrible; a ridiculously sentimental piece of claptrap that’s as obvious as it is distasteful. A dead dog of a song about – fittingly - a dead dog, this risible tale originally appeared on Gentleman Jim’s 1961 album Talkin’ to Your Heart. 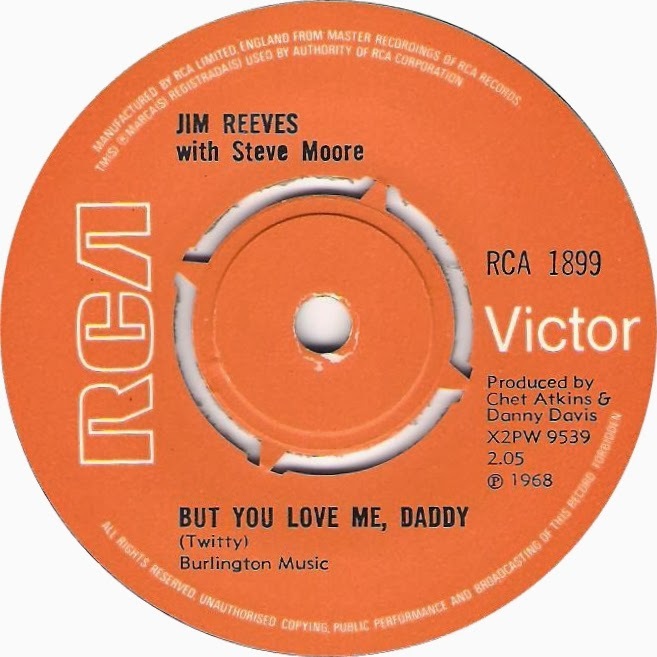 Today’s second track is the vile But You Love Me, Daddy, issued in the UK as an A-side (believe it or not) in 1969. The song had been recorded 10 years earlier but Reeves wisely declined to release it – something he couldn’t prevent once he’d snuffed it. Producer Atkins dusted off the acetate, dubbed on some basic orchestration and landed yet another hit for the Reeves estate. Incidentally the whiny child heard on But You Love Me, Daddy – and credited on the disc as Steve Moore – is better known these days as R Stevie Moore, the incredibly prolific low-fi legend. Moore’s appearance on the 1959 recording marks his debut studio session; he had been brought in by his bass playing father Bob Moore to re-record the child's vocal line, originally laid down by Dorothy Dillard. The song was written by Kathryn Twitty (occasionally credited as Pat Twitty, and no relation to the singer Conway Twitty) who also wrote Teach Me How to Pray recorded and released in 1959 by Reeves. It was later covered by wife-swapping Scots entertainers The Krankies. Fans of the late, great Kenny Everett may remember today's track. Revelation appeared at number 25 in Cuddly Ken's first Bottom 30 selection, broadcast in the1977, just two years after this appalling piece of God-bothering garbage was released. Recorded by the otherwise unknown (at least in this guise) Daniel, this impossibly awful piece of dreck comes with an impeccable heritage. It was written by Bobby Braddock, a member of the Country Music Hall of Fame and composer of upteen hits over his 40-plus year career, and produced by Dan Hoffman a former disc jockey and A&R man who, along with Braddock, had worked with many big-name Nashville stars including Tammy Wynette. 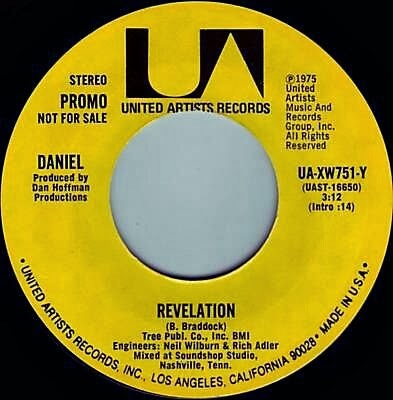 Revelation was originally written in 1971 and was recorded in the same year by Waylon Jennings: Waylon's 'traditional' (i.e. sung rather than narrated) version of the song appeared on his 1972 album Ladies Love Outlaws. It's been recorded by a number of different artists since then, all wisely eschewing Daniel's unique, portentous style. With his sonorous vocal performance - not a million miles away from the spoken word horrors of Eamonn Andrews or Red Sovine - he sounds like Tim Lovejoy's boring brother delivering a slice of Christian country balladry. I'm guessing that Daniel and Dan Hoffman are one and the same person: the delivery of this track is so similar to those of other US radio DJs (Goodbye Sam by Shad O'Shea, for example). Although the majority of copies that turn up for sale are mono/stereo promos (as is my own copy), this appalling single did actually receive a limited commercial release in the States, backed with a track titled Gone Are The Days, co-written by Hoffman. Thankfully it failed to chart and Daniel does not appear to have recorded a follow up, although as Daniel D Hoffman (if Dan the writer/producer and Dan the performer are one and the same) he had previously issued a 45 - String (a Tribute) - on Cherish records in 1974...a copy of which is winging its way towards me as I type. Soon the mystery will be solved. A pair of pieces of piffle for you today, from 1983 and producer Mike Hurst – former member of hit groups The Springfields and producer for Cat Stevens, P P Arnold, Showaddywaddy, Lena Zavaroni and countless others. I picked these up for 50p each in a charity shop just before Christmas – and I reckon I was robbed. I shudder to think how this crap came together. Almost a decade before Michael Cretu would unleash his multi-platinum Enigma project on the pop music world, some other bright spark had the idea of adding drum beats to church music, only with disastrous results. The consequence of this unholy melee was two A-sides from the Altar Boys (who, on the first release at least sound to me like a lone vocalist plumbing the depths of a multi-track hell) – the almost passable Be-Bop-A-Lula and the diabolically awful You Really Got Me. For some peculiar reason the previous owner has scrawled the words 'good disco' on the label of the latter: there was clearly something wrong with him. Be-Bop-A-Lula begins with a line stolen from God Rest Ye, Merry Gentlemen: I assume that means that it was issued not long before Christmas. The odd thing is that I was working as the singles buyer for HMV in Gloucester when these were released, and it was me that dealt with the rep - the lovely Maggie from IDS (Independent Distribution Services) - who would have been promoting them, yet I have no memory of them at all. There aren’t many clues as to who – outside of Hurst that is - is involved in this rubbish. The B-sides of both singles are standard, uninspired pub-rock (Isn’t It About Time, written by Marshall, and See Me Now, written by Steve Price respectively); the only good thing to say about any of this is that in the same year the engineer of these abortions - Stewart Eales - also worked on the utterly brilliant I’m a Teapot by the Geisha Girls, one of my all-time favourite 45s. Any further info gratefully received. Heavily influenced by Screamin’ Jay Hawkins (and a massive influence himself on Alice Cooper), David Edward Screaming Lord Sutch began his performing career at the tail end of the 1950s. He and his group, the Savages, were known for their frantic stage show and he soon caught the eye of maverick producer Joe Meek, who brought him into his Holloway Rd studio to record a series of 45 - the best known - Jack the Ripper (1963) becoming something of an anthem for Sutch. He would re-record the song several times during his career. 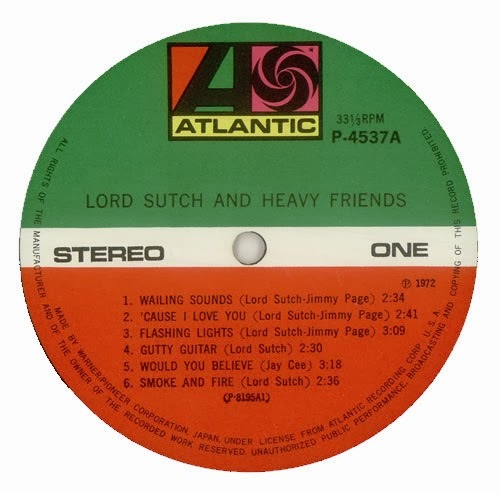 Bizarrely, although Sutch had been releasing records for 10 years, Lord Sutch and Heavy Friends, issued in 1970 but recorded the previous summer, was his first full-length album. Recorded in Los Angeles, Sutch was joined by some of the greats of the burgeoning heavy rock scene - including Noel Redding, Jeff Beck, John Bonham and Jimmy Page. Page and Sutch had known each other for years; both had worked for Meek and Page had played guitar on Sutch’s 1964 single She’s Fallen In Love With a Monster Man. However Sutch’s desire to cut an album that would be “modern rock ‘n’ roll with the real Zeppelin sound’, as he put it, would result in this awful cacophony. By the time Lord Sutch and Heavy Friends was issued, Led Zeppelin had become international superstars - their second album going to Number One in the UK, US, Australia, Spain and Canada and hitting the Top 10 in many other countries. In the US and Japan the company attempted to cash in on Led Zep’s fame, with Page and Bonham being given more prominence than the Good Lord himself on single sleeves: the US 45 release of ‘Cause I Love You features Page alone on the cover. Buoyed by their presence, the album scraped into the Billboard Top 100 but failed to chart elsewhere. Critical reaction to Lord Sutch and Heavy Friends was entirely negative; Rolling Stone Magazine said that the musicians on the album sounded ‘like a fouled parody of themselves,’ and in a 1998 BBC poll the album was named as the worst of all time. The following year Sutch assembled another collection of Heavy Friends, this time including Keith Moon and Ritchie Blackmore (who had also worked alongside Sutch at Holloway Road), to perform with him at the Country Club in Hampstead where he was booked for several nights. Blackmore noticed that Sutch had secreted recording equipment around the building but none of the artists who joined him on stage were aware that His Lordship was surreptitiously recording a follow-up album - The Hands of Jack the Ripper - which appeared in the shops in 1972. Says Blackmore: "Sutch phones me up and said 'Do you fance playing tomorrow night?' I agreed and I came down with Matt Fisher of Procol Harum, and we did just a night of playing. And I saw the recording equipment and thought, 'He's doing it again'." In later years Sutch became more famous for his failed attempts to break into politics with his Monster Raving Loony party than for his music. He committed suicide in 1999 after suffering from depression for most of his life. Despite what you might read elsewhere, Sutch never was a bone fide lord: although he affected the title for his stage persona, his name always remained David Edward Sutch. Here’s a brace of cuts from this classic of bad music - Wailing Sounds and the diabolically awful Brightest Light, both featuring Bonham and Page, with Brightest Light also featuring overdubs from Jeff Beck.